Following a long tradition in the Valley of the Sun, the land that now encompasses the Campus Vista Historic District was platted for subdivision from agricultural lands outside the Phoenix city limits (See Historic Residential Subdivisions and Architecture in Phoenix, 1934-1963). Although this type of suburban development flourished in the 1910’s and 1920’s, the onset of the Great Depression curtailed many construction projects for much of the decade. As the Depression-era economy improved in the late 1930’s, Phoenix resumed its suburban growth, particularly to the north, and a number of would-be developers purchased nearby farmland for more profitable residential development. While projects were cut short by restrictions against non-essential construction during World War II, they regained momentum in the early postwar era when Phoenix’s population boomed. Neighborhoods built during this time play an important role in understanding the transition between pre-war and postwar subdivision practices. Started in the waning years of the Great Depression and built out in the early postwar era, the Campus Vista Historic District illustrates these trends to a remarkable degree. In the late 1930’s, Phoenicians considered the land around W. Thomas Road and N. 15th Avenues to be “out in the country” (Phoenix College Website). That perception changed when Phoenix College relocated to a 52-acre site on the north side of W. Thomas Road in 1939. Built with $750,000 in Works Progress Administration (WPA) funds, the college attracted residents and businesses to its environs and the agricultural landscape quickly shifted to suburban neighborhoods and commercial nodes. Property owners in the vicinity of the new campus seized the opportunity to sell their farmland for more profitable suburban development. In the decade following the construction of Phoenix College, numerous subdivisions rose from the surrounding farmland. Among them were the six subdivisions, College Addition (1939), Campus Vista (1945), Mulberry Place (1946), Mocking Bird Manor (1946), Campus Manor (1946) and Aztec Place (1948), and remnants of a seventh, East Mulberry Place (1946), that make up the Campus Vista Historic District. Thomas and Minnie Caldwell were among the first to capitalize on their property’s location at the edge of the new campus. Early in 1939, they seized the opportunity to sell part of their farm to Frank and Clara Barton for more profitable residential subdivision. The Bartons and their partner, L. E. Patterson, platted the College Addition in March 1939 (Weight 2003). It was undoubtedly named to emphasize its proximity to the new campus. The Barton-Patterson partnership carved their property into forty-one substantial lots of about 8,000 square feet apiece on a slightly curving street. Development proceeded in accordance with FHA guidelines, which called for adequate lot sizes, established utilities, and variation in street design. The developers provided fully paid improvements such as city water, gas and electricity. FHA compliance and the availability of FHA insured mortgage loans proved to be a major selling point for the project. Development in the College Addition was relatively small-scale and featured both speculative and custom-built houses. Two developers were responsible for much of the construction in the addition and each engaged in both speculative and custom building. General contractor Elmer Schler was one of the first builders in the College Addition; in 1940, he built two homes on a speculative basis. The two were cement block houses with steel sash windows on N. Eighth Avenue. At the same time, Schler offered to sell lots where he proposed to build “charming homes . . . for gracious living” to suit individual buyers. The W. J. Murphy Realty Company also advertised both “spec” houses and lots for custom design (Weight 2003). Sales in the College Addition were geared to traditional families in which the husband worked away from home and the wife tended the household. Schler hoped to attract homemakers by advertising his custom homes as modern, step-saving havens of “smart design” intended “to make housekeeping a joy” (Weight 2003). Developers further appealed to young families by advertising their homesites as being “just a stone’s throw from the beautiful Encanto Park”(Weight 2003). They also pitched to a higher income bracket or, perhaps, to families who aspired to greater status; Murphy advertised two “spec” houses at $4,000 and $4,350, about 25 percent higher than the median home value in Phoenix in 1940 (Weight 2003). For the extra money, home buyers received houses with three bedrooms and two baths (The Arizona Republic, May 11, 1947), an almost unheard of luxury in pre-war houses built for middle class families. Murphy further sweetened the deal by offering FHA terms (Weight 2003), a major incentive to new home buyers. Yet another attraction of the College Addition was the college itself. The newly built Phoenix College boasted an enrollment of 714 students for the 1938-1939 academic year, making it the state’s third largest institution of higher learning (Weight 2003). Developers advertised its proximity to the new subdivision to attract students, teachers, and college employees (The Arizona Republic, May 11, 1947; Weight 2003). City directories for the period indicate that a number of teachers, administrators, and students associated with Phoenix College lived in the nearby additions, including College Addition. All of these factors made the College Addition extremely attractive to home buyers in the late 1930’s when the economy had finally improved and federally-insured loans made mortgages easier to obtain. Sales were brisk and the addition was built out within two years. 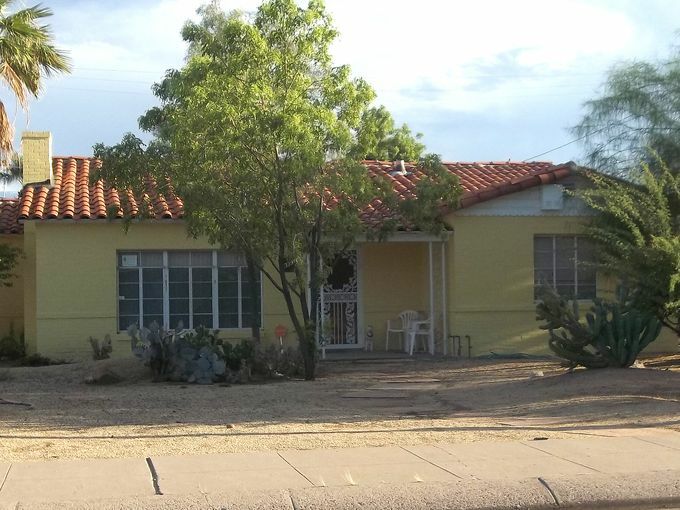 Transitional/Early Ranch style houses filled the streets, their masonry construction and minimal ornamentation reflected the trends found in small-scale subdivision development in Phoenix on the eve of World War II (Weight 2003). Development in the College Addition influenced others to build in the area but the federally-mandated moratorium on non-essential building in 1942 put additional subdivision plans on hold until after the war (Weight 2003). As soon as restrictions on residential construction were lifted after the war, six subdivisions near the College Addition were platted for immediate development; they are Campus Vista (1945), Mocking Bird Manor (1946), Mulberry Place (1946), East Mulberry Place (1946), Campus Manor (1947), and Aztec Place (1948). Selling points for these subdivisions included their close-in locations, proximity to a major public park, and modern construction and amenities. Phoenix College, whose enrollment numbers soared with returning veterans attending school on the G. I. Bill, remained a major attraction to would-be buyers. Student figures continued to climb in the postwar era, from 2,000 in 1948 to nearly 10,000 by the late 1950’s (Weight 2003). The burgeoning college population proved an ideal market for the newly opened subdivisions whose location so close to the college all but guaranteed their success. Advertisements seemed to target middle- to upper-middle class families as homes were marketed for their modern design and conveniences rather than for affordability. Owner/builder Willard Mouritsen was typical of developers who promoted the Campus Vista subdivisions. In newspaper advertisements, he appealed to “discriminating buyers” for his houses in the Campus Vista Addition. He promised quality homes in a beautiful location immediately east of Phoenix Junior College (Arizona Republic, May 11, 1947). Despite the demand for housing, production was plagued by a materials shortage in the early postwar period that did not ease until 1948. Immediately after the war, only about a dozen houses were completed each year. Once wartime restrictions were lifted, however, the pace of construction quickened and in 1948, 58 houses were completed in the Campus Vista Historic District (Weight 2003). Construction levels declined the following year in response to a housing surplus precipitated by over-zealous builders. As a result, only six houses were built in the Campus Vista Historic District in 1949. The slump was brief, however, and the market rebounded in 1950. Construction continued at a steady clip and by 1956, the district was almost entirely built out with single-family houses, duplexes, and three churches. Only five resources in Campus Vista Historic District post-date 1956 (Weight 2003). The Campus Vista Historic District was a transitional neighborhood that was built partly according to pre-war patterns and partly according to postwar trends. The result is a heterogeneous district that nonetheless conveys a sense of cohesiveness through similar setbacks, lot and house sizes, street layout, residential design, and building materials. Following pre-war traditions, more than 70 different builders contributed to the development of the Campus Vista Historic District, a fact that resulted in a variety of building types and design motifs. Notable among them are Lescher & Mahoney/Westward, Valley Construction Company, and C.F. Crittenden. Other Campus Vista builders include G.N. Richards, Ralph Haver, Frank Wallace, Willard Mouritsen, Bowers & Darrow Construction Company, C.L. Jones, and Barer & Young. The mixture of speculative ventures and custom-designed houses added to the district’s variety; about half of the houses were built on a speculative basis and about half were custom-built homes (Weight 2003). At the same time, FHA guidelines and popular preferences helped maintain a sense of cohesiveness throughout the district. FHA recommendations influenced the curvilinear street layout, large lot size (approximately 70 feet wide by 125 feet deep), standard setbacks (25-30 feet), and house sizes (approximately 1,600 square feet). Assembly-line production, standardized materials, and the overwhelming popularity of the one-story masonry Ranch style house, variations of which were built throughout the district, all contributed to convey a sense of cohesion throughout the district. Unity was further achieved by the use of similar building materials such as brick, block, asphalt shingles, casement windows, and design (Weight, 2003). The district has been well maintained in the ensuing decades. Alterations have generally been limited to window, siding and roofing material replacements, addition or enclosure of carports and garages, patio additions and the application of paint or stucco on masonry walls. The district retains a high level of integrity with 81 percent of resources contributing. The Campus Vista Historic District is a neighborhood of one-story single-family houses, although eight duplexes and three churches contribute to the district’s building stock. Nearly all houses in the Campus Vista Historic District are variations on the fashionable Ranch style which dominated residential design after World War II. Campus Vista’s Ranch style houses are all one-story, a hallmark of the design. Most feature hipped roofs and steel casement windows. Virtually all of the district’s houses are masonry with approximately half rendered in brick and 1/3 constructed of painted concrete block; the remaining houses are stuccoed block or stucco over wood frame (Weight 2003). Flemish bond brick patterns and tile roof ridge caps are common ornamental features found on Ranch style houses in Campus Vista. Typical Ranch style houses include 912 West Campus Drive and 1321 West Mulberry Drive. Variations on the Ranch style found in the district include American Colonial (1007 West Flower Street), Spanish Colonial Ranch (901 West Catalina Drive), Modern Ranch (911 West Avalon Drive) and Transitional Ranch (2917 North 8th Avenue). Although a pure French Provincial Ranch is not found within the district, some house designs were influenced by this style, such as 917 West Catalina Drive. Ranch style duplexes are found within the district as exemplified by 3306-3308 North 11th Avenue and 1309-1311 West Osborn Road. Two Cape Cod Revival style houses are also present within the subdivision, as typified by 2933 North 9th Avenue. One Colonial Revival house (922 West Avalon Drive) is also present. Three religious complexes are present within Campus Vista, a development pattern common to residential neighborhoods. These complexes compliment the subdivisions’ residences in both scale and materials. The first, Good Shepherd Evangelical Lutheran Church (3040 North 7th Avenue) has been a neighborhood presence since its first parish hall was constructed in 1947. As the neighborhood grew in popularity and size, the congregation expanded into a complex of buildings, including a new sanctuary (1960) and parsonage (1970). Its existing buildings have been expanded over time. A fence wall was constructed in the mid-1980’s to formally enclose the church complex. The second, Temple Beth Israel (3310 North 10th Avenue) was constructed in 1948-49 with concrete block. An adjacent classroom building was constructed in 1959. Temple Beth Israel was later purchased by Phoenix College and modified for educational purposes. The third religious complex, College Park Baptist Church (1333-1349 West Osborn Road), was constructed of concrete block in 1954. The congregation had first constructed a church in 1947, but it was since demolished. A parsonage was likely built concurrent with the first church and is extant. With its proximity to Phoenix College and draw to upper middle class families, Campus Vista was home to many students, teachers and administrators as well as other accomplished residents. Only a handful of residents were recorded in the 1946 city directories. Among them were J. C. Campbell (2921 North 8th Avenue), an employee at Tovrea’s, G. M. Wright (3018 North 8th Avenue), a soil specialist with the United States Department of Agriculture, and attorney W. E. Miller (724 West Avalon Drive). All owned their homes (Phoenix City Directory, 1946). By 1949, they were joined by H. L. Thomas (2917 North 9th Avenue), an agricultural economist with the United States Bureau of Reclamation, W. J. Miller (934 West Campus Drive), an accountant for Del Webb Construction, W. W. Kyle (907 West Catalina Drive), an assistant manager, salesman W. F. Samuels (929 West Catalina Drive), physician Jeffery Millar (1340 West Mulberry Street), rancher L. J. Tustin (845 West Earll Drive), and E. . G. Clemens (1302 West Flower Street), with the Arizona Home Improvement Company. From their occupations, the district apparently attracted middle and upper-middle class families. A random sample of 16 residents that year showed 100% home ownership (Phoenix City Directory. 1949). Little changed in the demographic makeup in the following years. In 1953, when the district was largely built out, the neighborhood saw a mixture of teachers, students, salesmen, managers, business owners, and professionals. Educators included E. M. Andres (3013 North 9th Avenue) and Emanuel Smith ( West Flower Street), both teachers at Phoenix College, and Virginia Tufte (917 West Aval1007on Drive), a teacher at West Phoenix High School. J. J. Ehrhard (2917 North 9th Avenue), was a student and M. A. Boninger (906 West Campus Drive), was the youth director for the First Baptist Church. Business owners included L. W. Jackson (3327 North 15th Avenue), co-owner of Jackson-Benton Sales Company, R. J. Schubert (933 West Avalon Drive), of Schubert Liquor Company, and K. A. Sadick (1255 West Osborn Road) of the Kenneth A. Sadick Insurance Agency. Home ownership remained high; 23 of 27 randomly selected homes were owner-occupied (Phoenix City Directory, 1953). By 1957, the district was entirely built out with single-family houses, duplexes, and several churches, including Temple Beth Israel. Home ownership was almost universal throughout the district which remained largely middle- and upper-middle class in character. Several residents had risen in their professions including Willett Munsil (3331 North 10th Avenue), President of Munsil Brothers Builders, Augusta Martin (3332 North 11th Avenue), the Deputy County Treasurer, C. E. Haley (917 West Avalon Drive), chief engineer with the City Traffic Engineering Division, Albert Plotkin (930 West Catalina Drive), Rabbi, Temple Beth Israel, and A. E. Banks (917 West Verde Lane), president of Associated Dairy Products (Phoenix City Directory, 1957). At the close of the historic period, in 1963, many of the district’s houses were occupied by the original owners, including C. I. Thomas (721 West Earll Drive), a sales manager with IBM, rancher L. J. Tusin (845 West Earll Drive), physician Jeffrey Millard (1340 West Mulberry Drive), public relations manager J. J. McMullan (936 West Verde Lane), J. C. Campbell (2921 North 8th Avenue), the foreman of Western Provision, N. J. Giurlanda (3317 North 13th Avenue), an employee of King’s Cocktail Lounge, and W. E. Miller (724 West Avalon Drive), a security officer at Motorola. Thirty of 32 randomly selected homes were owner-occupied. From the earliest construction in 1940, through the historic period ending in 1963, the Campus Vista Historic District was largely occupied by middle and upper-middle class families, many of whom worked in education, medicine, and management. An unusually high degree of home ownership throughout the period is indicative of the district’s stability and value. One of the district’s residents, Cliff Wharton (931 West Verde Lane), is noteworthy as the first African-American United States ambassador and the first African-American Foreign Service Officer to be chief of the United States diplomatic mission.